University of Michigan School of Public Health, M.H.S.A. Angela Gamalski is a healthcare attorney who focuses her practice on assisting clients with business transactions, mergers and acquisitions, and regulatory compliance matters. She works with clients across the health care industry. 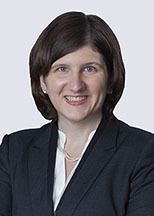 Angela joins Honigman with ten years’ of non-legal experience in the health care industry, most recently with responsibilities for health care compliance operations, including the HIPAA privacy program, Medicare enrollment and Corporate Integrity Agreement requirements of a community health system.